It’s the first weekend of March and I am so swarmed with lots of reviews pending! I have been blessed to be receiving much love from many brands, giving me surprises almost every week now since the start of the year, thank you! You may think that the life of a beauty blogger is great, with lots of brands sending products to the doorstep, but seriously, think again. All the effort to photograph products, testing and trying out products while running the risk of having breakouts is definitely not an easy feat. Well, I guess all my efforts are worth it because I simply enjoy the process of it. 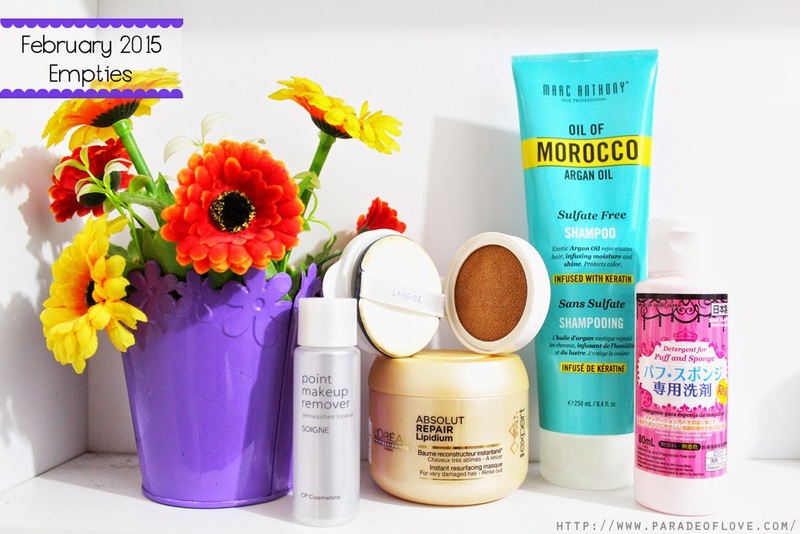 Anyway, I’m proud to be using up products again but this month’s list is going to be short and sweet. I’ve kind of grown immune to the fact that nothing can be done to my hair. Having frizzy, unruly mane is what I’ve grown up with due to the inheritance from my mother. 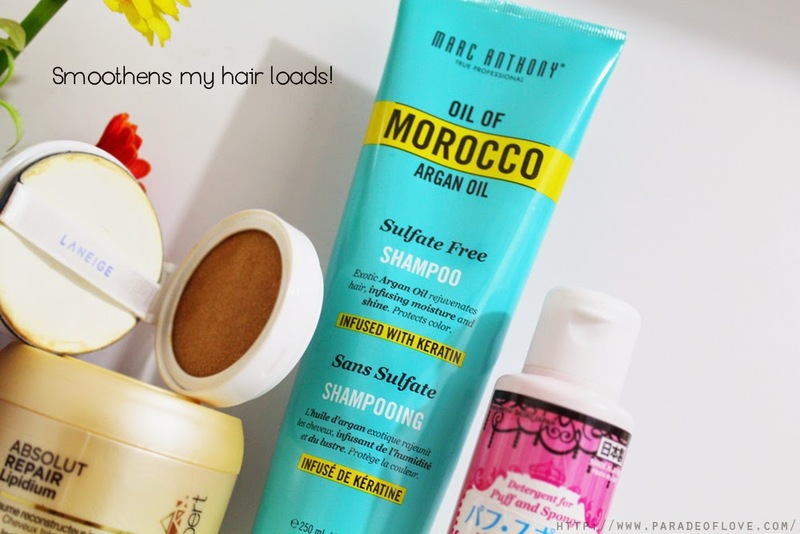 Fortunately, the Marc Anthony Oil of Morocco Argan Oil Shampoo has been doing me a favour by slightly taming those frizz. It comes in a squeeze tube unlike usual shampoos and I kind of wished it came in a huge bottle instead. I find that after going through this bottle, my hair feels more weighed down and smoother, which is a huge plus point for me! I’m concurrently using the hair oil from the same range but the huge downside for me is the scent of argan oil which isn’t very nose-friendly. 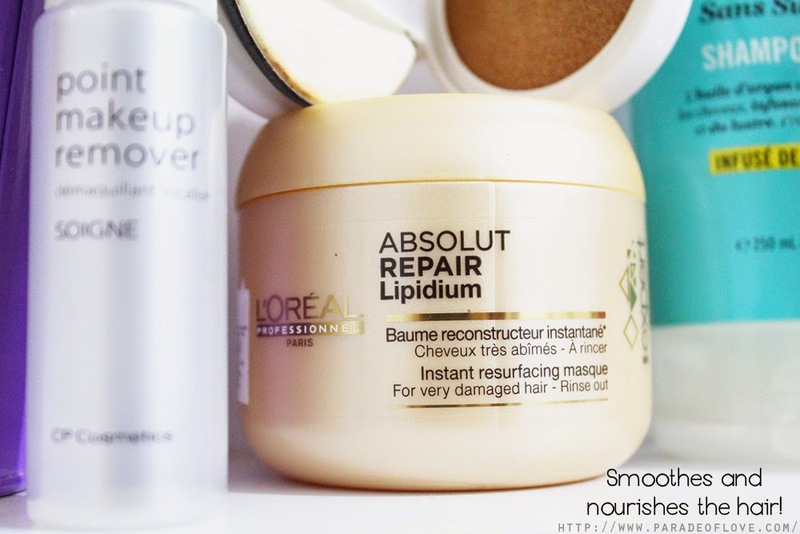 On the same category of hair care, I have also used up the L’Oreal Professionnel ABSOLUT REPAIR Lipidium Instant Resurfacing Masque. Like the argan oil shampoo, this also has a strong scent to it which isn’t exactly very nice-smelling. It also performs fairly well in terms of trying to repair my damaged hair. Following advice from my fellow beauty fanatics, I used this as a daily conditioner instead which is a lot of effective than using it once a week. I wouldn’t say this is fantastic for my “wire tresses” (that’s how my sister describes my hair) but for someone with damaged hair from non-genetic factors, it probably will work a lot better. For someone who wears makeup all the time if I need to step out of the house, makeup removers are essentials in my bathroom. I practically have all kinds of makeup removers, ranging from cleansing oils to varying micellar water/solutions to even makeup remover wipes! That’s how much I am obsessed about cleansing out all the stuff I pile on my skin at the end of every makeup-wearing day. 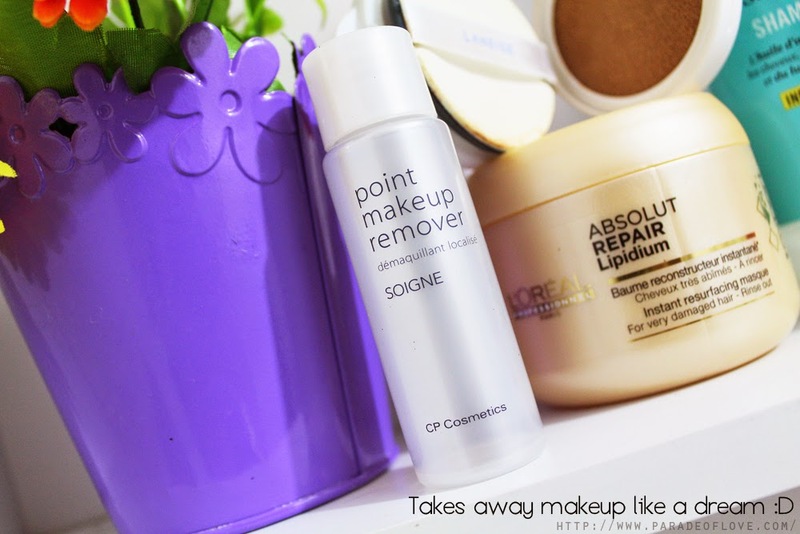 I’ve constantly been enjoying this Point Makeup Remover from Soigne, CP Cosmetics, which I’ve gotten from my spa boutique, Face Bistro. Typically, you dispense the solution on a cotton pad and it does a really awesome job in wiping out all your makeup, including stubborn, bright and matte lipsticks. If not for the hefty price tag, I’d make this a staple. If you’re interested, you can find the range of products here. 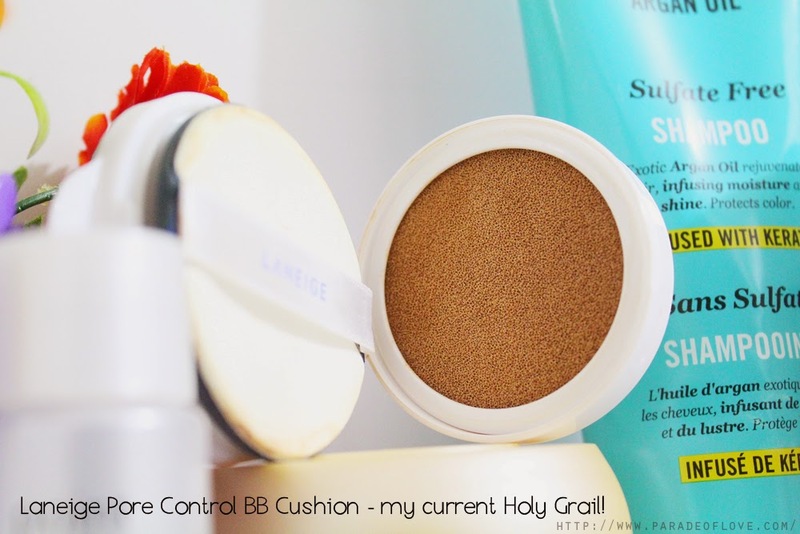 I’m very proud to announce that I have finished using my holy grail BB cushion, none other than the Laneige Pore Control BB Cushion! I have yet to try the original one but I’ve really been enjoying the medium coverage and semi-matte texture a whole lot. This is probably going to be my one and only choice for BB cushion because of my skin sensitivity so I’d better restock on this baby! The good thing about each box of BB cushion is that you get 1 in the casing itself and 1 refill! It’s worth every single cent you are paying for in my opinion and I’m really glad to have discovered this! The last product will not be surprising and I’ve probably gone through more than 10 bottles of it already by now! 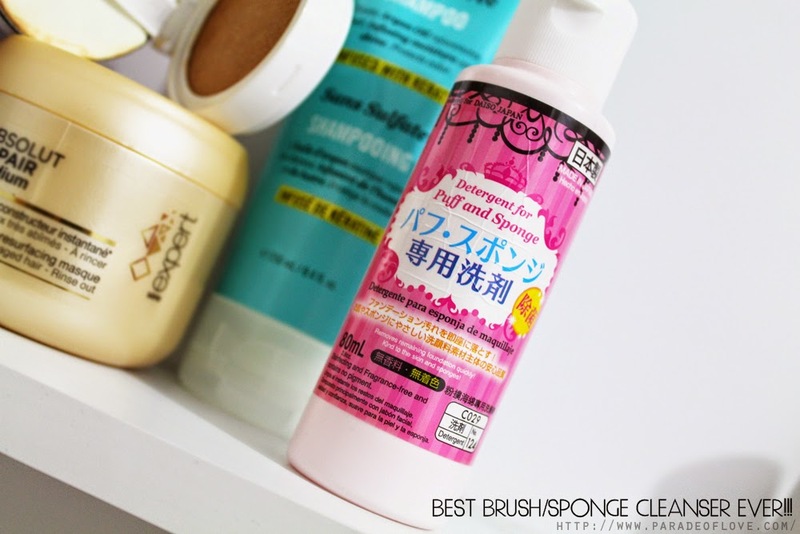 Honestly, the best cleanser for makeup brushes and sponges can be found in Daiso. I have tried many expensive ones including the Beauty Blender Solid Cleanser but this $2 bottle is indeed a gem. All you need to do is fill a small container with water, add a few squirts of this liquid and swirl your brushes into the mixture! You’ll be able to see all the gunk dissolving into the solution within seconds. This is by far the best $2 I’ve ever spent in my life! I urge you to get this if you haven’t! Disclaimer: Some products were sent by the respective brands previously. The above review is based on my true and honest opinion without influence from others. Oh man I hope you do find it! They always run out of stock for that! And yes, go try that BB cushion, it's really very good! I think I will just finish like tons of it! Oh, The Face Shop Cushion Screen Cell has 3 shades! You can try the darker shade. I updated the post with 3 more shades the brand told me about!